Today’s information technology (IT) infrastructure is fully entwined with basic business operations, so crucial business questions become IT questions. What is it worth to stay ahead of the competition? What is a better online customer experience worth to the bottom line? What advantages are gained by making faster, more informed business decisions? Can you afford not to have the best possible fraud protection and data security? When you answer these business-critical questions in terms of IT infrastructure, and recognize the crucial role storage plays in correct answers, the value of IBM® FlashSystem™ skyrockets. 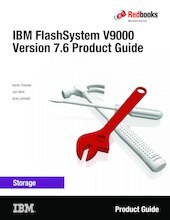 This IBM Redbooks® Product Guide describes IBM FlashSystem® V9000, which is a comprehensive all-flash enterprise storage solution that delivers the full capabilities of IBM FlashCore™ technology. In addition, it provides a rich set of software-defined storage features, including IBM Real-time Compression™, dynamic tiering, thin provisioning, snapshots, cloning, replication, data copy services, and IBM HyperSwap® for high availability. With the release of FlashSystem V9000 Software V7.6, extra functions are available, including VMware vSphere Virtual Volumes (vVol) support, encryption support for externally virtualized storage, and an integrated IBM Comprestimator utility. Support also exists for VMware 6 that enhances and improves scalability in a VMware environment. FlashSystem V9000 Software version 7.6 replaces version 7.5, and is available to all IBM FlashSystem V9000 customers with current warranty or software maintenance agreements.